Whether you’ve just made an appointment for a past life reading with Ainslie MacLeod or considering getting one, give yourself plenty of time to read his books before the session. The information Ainslie and his guides bring you are all based on what’s in these books. You do not want to waste your valuable session time on having Ainslie explain the basics that you could have learned from these books. The Instruction talks about soul ages, types, missions, fears, and more. What are yours? For your soul types, you can take the quiz on the site. The top results were spot on compared to what Ainslie told me during the session. 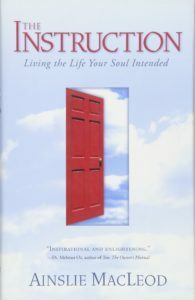 In the book, he provides the Open Heart meditation to help you connect with your guides in figuring out your own soul ages, types, missions, and fears. I was not really good at meditation and not sensitive enough to get messages from my guides. I tried anyway but in the end I just picked what felt right for me. Don’t worry about getting it wrong. It’s more important that you have something to base on in case Ainslie tells you otherwise (like he did with Oprah, about 31:11 into this audio interview). Pay extra attention to the differences, they might be important. For me, they kept taking me back to how I was as a child, my true self. 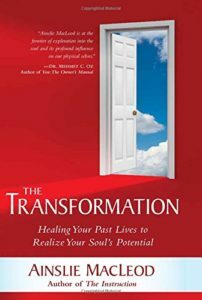 The Transformation talks deeper about our past life fears and how it will change the future of humanity through The Transformation. The Transformation is the upcoming shift to “Stage Four Consciousness”, the final level. In the shift to “Stage Three Consciousness” human gained the abilities of intellect. In stage four, we reconnect with our soul, resulting in the best balance of mind and spirit. Depending on your situation, he and his guides might provide a specific healing exercise along with the particular fear you are facing currently. Once you know what your past life fears are, the book is also a good DIY healing tool. Be aware of what/who drains your energy, what keeps your spirit down, take notes on the patterns that emerged. If you don’t know where to start, begin by scribbling circles. When something pops into your mind, write it down, even if it doesn’t make sense. Once you start, keep going, no judging, no crossing out, don’t stop until you know you are done. Then go back to see what jumps out at you. Review your lists from the two books, especially if it has been months since you last read them. Read the FAQ to make sure you didn’t miss anything. Get ready to take notes with your favorite pen/pencil and paper/notebook, the session is not recorded. Ainslie is really easy to talk to, just follow his lead. Listen well and write as much down as possible. There will be so much information coming your way, you really don’t want to miss anything. Take an hour or two to redo your notes while the memory is fresh. In the process, you might remember things you missed, or emotional reactions you had, put those down as well. Go through your notes with both books to help your healing or growing process. Pay attention to the changes in your body and your emotion states, I usually write them down or talk to a friend about it. It’s like airing out of your rug, though it might take a while but once the old dusts are gone with the wind, they are gone for good. I very much enjoyed my sessions with Ainslie. He and his guides confirmed and cleared many things for me. It has been more than six months since my first session and I am still noticing patterns that he mentioned which I couldn’t recognize at the time. I am finally moving forward with a clear purpose, work is finally like play. Some of my physical issues also improved, not to mention how much happier and more energetic I am. Finding your true self is an adventure that is worth the challenge. Ainslie and his guides just make it easier. I hope this will help you get the most out of your time with Ainslie. The Transformation is happening and I am glad you are coming with me. Posted in Healing Tools	| Tagged Ainslie MacLeod, past life reading, soul healing, spiritual growth	| Comment?